Hi there. My name is Graeme Bliss and I am 42 years old and cannot believe how big the Vintage MX scene is word wide. I live in a country town of 65,000 people called Wagga Wagga in New South Wales. Dirt bikes are big here with a strong MX, Dirt Track, Enduro and Speedway club. My MX hero was, of course, MARTY SMITH of whom I had posters all over my walls as a young kid and hated to buy MX Action and see Marty getting beat by that upstart Bob Hannah. I restored my baby from a basket case to the cost of $5000 Australian and I am still getting small items from ebay to complete it. I ride it a few times a year and it presently has about 7 hours use on the motor. All who see my Elsie cannot believe their eyes as many of them had one similar when younger. 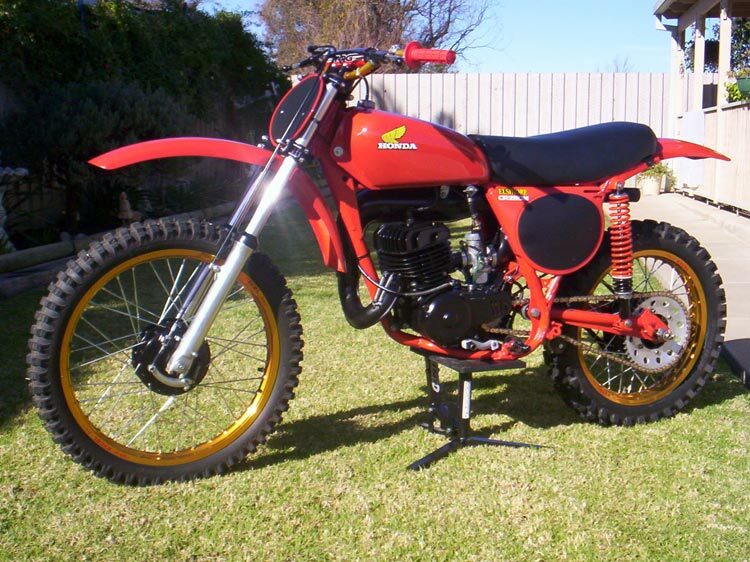 I would really like a 1979 CR250R as I am over 6 feet tall and fairly hefty, but the Red Devil still goes really hard.